All Progressives Congress (APC) National Chairman Adams Oshiomhole is insisting on Senate President Bukola Saraki’s removal. His time is up, he said. But he said there is a condition for Saraki to remain in office. To retain the Senate presidency, he said, the only condition is for Saraki to return to the APC. Besides, the Senate President will be removed legally, Oshiomhole insisted yesterday. Oshiomhole, who spoke at a meeting with APC National Assembly members, said however that the party was not ready to welcome the Senate President back to its fold, insisting that Saraki will be removed legally as minority cannot preside over majority. The former Edo State governor asked those who have become judges to be prepared to challenge the impeachment of the Senate president in any court of their choice. He was apparently referring to the recent judgement of the Court of Appeal which says that the Assembly has a right to its independence. Some governors were not at the meeting. 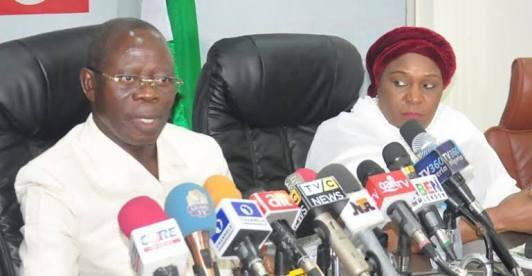 Oshiomhole also said they could not attend as a result of “communication breakdown”. He said: “Democracy teaches us that minority has the right to have their say but majority must have their way. So, if we have 56 senators and they have 49 senators, I insist that 49 senators cannot preside over the affairs of a house in which APC has 56 senators. And I ask them to tell us anywhere in the world where minority rules over majority. “So, I want to repeat, Sen. Saraki as president of the Senate will be lawfully and democratically impeached. It will not be illegally done. It will be done according to law and tradition. “Those lawyers who have chosen to sit as judges need to be reminded that lawyers are, at best, officers of the court and do not constitute the court. So, when Sen. Saraki is lawfully and democratically impeached, they will be free to go to anywhere they want to go and canvass the legality or the illegality of the action. It is not in their place to pronounce with finality as if they constitute the judicial arm of government. “The only way that, probably, he could have retained that seat is to decide to return but we will not be ready to welcome him. He must remain where he is and we will continue to ensure that he surrenders the presidency of the Senate to the majority party in the Senate – in line with the provisions of our constitution. “We have very many important issues, which require the National Assembly to deliberate on. Those issues that were pending when the two presiding officers hurriedly adjourned the deliberations of the House without exhausting the calendar. “The result is that we have serious pending issues that require deliebertaions by the National Assembly, including the issue of the apprval of foreign loans without which this year’s budget cannot perform; the issue of the INEC budget and virement of the budget. “Ours is to appeal to all of you that your commitment to the sustenance of democracy is enough to get you to do all that you can to get the National Assembly to reconvene so that these and other weighty national issues will be deliberated upon, appropriate decisions reached so that the Nigerian government is not shut down. “If we do not take those steps and government cannot spend money that should be appropriated, we run the risk of government shutdown. As members of the governing party, I believe you will do whatever is needed to be done to prevent a government shutdown. “I want to reassure you that we value you; all the stories about people being denied or that you would be frustrated out, I want to assure you that our party values experience; our party values knowledge; our party values loyalty and our party will do everything possible to reward loyalty and demonstrate that loyalty pays and we will not be ashamed to do so.